A boil water advisory has been put into effect for an extended period of time for SIRWA Customers and the Cities of Afton, Arispe, Creston, Cromwell, Lorimor, Shannon City and Thayer. Residents need to avoid drinking/injecting water from hydrants, water fountains, splash pads and the swimming pool. The water fountains and hydrants at the 3-mile camp ground and the city parks in Creston, Afton and Arispe will be shut off until advisory has been lifted. The bathrooms will remain in operation. Residents should boil water used for drinking, making ice, brushing teeth or preparing food. The water may be used for laundry as usual, showers and bathing as long as no water is swallowed. Dishes and utensils should be washed using bottled water or water that has been boiled. The Montgomery County Sheriff’s Office reports no injuries occurred during a two-vehicle accident on Friday morning. At 11:50am Deputies responded to the accident at 200th Street and Fernwood Avenue in Montgomery County. After investigation it was determined that a 2000 Ford F250 pickup owned by Gregg Greene and driven by 30-year-old Jeffrey Scott Greene of Malvern was westbound on 200th Street at about Fernwood Avenue. At the same time a 2015 Chrysler 200 4-door car owned and operated by 76-year-old Lawrence Leroy Lafollette of Red Oak was westbound as well and had slowed behind a vehicle turning left onto Fernwood Avenue. As Lafollette was getting back up to the posted speed limit he was rear-ended by Greene’s pickup. Both vehicles sustained disabling damage due to the accident. Damage to the Ford pickup was estimated at $7,500 and damage to the Chrysler was estimated at $8,000. Jeffrey Greene was cited for Following Too Close and Expired Registration Plates. Red Oak Fire assisted with cleanup at the scene. ADEL, Iowa (AP) — The mother of twin toddlers spotted wandering naked near a busy central Iowa highway has been given two years of probation. Dallas County District Court records say 19-year-old Jasmine Teed was sentenced Thursday to four years in prison, but the term was suspended. She also was told to perform 80 hours of community service. Teed had pleaded guilty to child endangerment. Officers were sent to a house along U.S. Highway 6 in Adel on Nov. 2. Police say witnesses reported seeing someone herd the unclothed 2-year-olds back in the house after they were spotted near the highway. An officer entered the house and called out but received no answer. The officer reported finding Teed asleep in a bedroom. Police say the outdoor temperature at the time was 43 degrees. NEW YORK (AP) — Four more deaths have been linked to a national food poisoning outbreak blamed on tainted lettuce, bringing the total to five. Health officials have tied the E. coli outbreak to romaine lettuce grown in Yuma, Arizona. The growing season there ended six weeks ago, and it’s unlikely any tainted lettuce is still in stores or people’s homes, given its short shelf life. But there can be a lag in reporting, and reports of illnesses have continued to come in. In an update today (Friday) on the nation’s largest E. coli outbreak in a decade, health officials said 25 more cases have been added, raising the total number of illnesses to 197 in 35 states. At least 89 people were hospitalized. Previously one death had been reported, in California. On Friday, health officials said they had learned of four more — one in Arkansas, one in New York, and two in Minnesota. The first illnesses occurred in March, and the most recent began on May 12, according to the Centers for Disease Control and Prevention. Many of the new cases were people who became ill two to three weeks ago, when contaminated lettuce was still being sold. Some said they did not eat romaine lettuce but were in close contact with someone who got sick after eating it. Most E. coli bacteria are not harmful, but some produce toxins that can cause severe illness. People who get sick from toxin-producing E. coli come down with symptoms about three to four days after swallowing the germ, with many suffering bloody diarrhea, severe stomach cramps and vomiting. Most people recover within a week, but some illnesses can last longer and be more severe. Air Quality Alert for southwest Iowa! The Iowa Department of Natural Resources has issued an Air Quality Alert for Adams, Cass, Fremont, Harrison, Mills, Monona, Montgomery, Page, Pottawattamie, Shelby and Taylor counties. Ozone levels near EPA health standards are expected to persist in these areas until 7 pm today. The DNR recommends that individuals with respiratory or heart disease, the elderly, and children limit prolonged outdoor exertion until air quality conditions improve. The PRIMARY ELECTION is June 5, 2018. Cass County Auditor Dale Sunderman says a person may vote early (cast an ABSENTEE ballot) at the Cass County Auditor’s office during office hours up thru 5 p.m. on June 4. The Cass County Auditor’s office is open until 5 p.m. on Friday, June 1 and also open from 8 p.m. until 5 p.m. on Saturday, June 2. On Tuesday, June 5, 2018 between 7:00 A.M. and 9:00 P.M. a PRIMARY ELECTION will be held for all qualified electors of Cass County to select certain candidates to appear on the General Election ballot, November 6, 2018. Iowa Law states that in order to vote in a PRIMARY ELECTION you must choose either a REPUBLICAN, LIBERTARIAN or a DEMOCRATIC PARTY Ballot. (Sec. 43.38, Code of Iowa) A voter may change party affiliation at the polls on the day of the election. Persons must be registered in Cass County and at their current residence address to be eligible to vote. Every VOTER IS REQUIRED TO PROVIDE IDENTIFICATION at the polling place before that voter may receive and cast a ballot. Iowa permits Election Day Registration. Residents of Cass County who are not currently registered in Cass County may register at the polls and vote on the day they vote (absentee or at the polls). The voter must present proof of identity and proof of residence address. Residents of Cass County who have changed their name/address since registering in Cass County will be required to re-register at the voting site before being permitted to vote. Persons attempting to vote in the wrong precinct will be directed to the correct precinct. Persons must register in Cass County to be eligible to vote in Cass County. 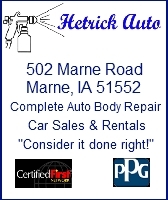 MUSCATINE, Iowa (AP) — An Iowa woman is now charged in the 1992 beating death of an engaged man with whom she allegedly had a sexual relationship. Annette Dee Cahill made a brief court appearance Friday from the Muscatine County Jail. She’s being held on a $1 million bond. The 55-year-old woman is charged with first-degree murder in the October 1992 slaying of Corey Lee Wieneke. He was found dead on his bedroom floor in rural West Liberty by his fiancée. Investigators say he was beaten with an aluminum baseball bat. Cahill didn’t enter a plea Friday. An attorney says he’s talking with Cahill’s family about representing her. Investigators say a new witness came forward last year claiming Cahill confessed to the killing. Cahill and Wieneke allegedly argued about “his involvement with another woman” the day he died. DES MOINES, Iowa (AP) — A judge agreed Friday (today) to temporarily block the most restrictive abortion law in the country from taking effect in Iowa next month under an agreement between lawyers for the state and abortion rights groups. Attorneys for the state and Republican Gov. Kim Reynolds said during a court hearing that they agreed to prevent the law from taking effect on July 1 after discussions with the American Civil Liberties Union of Iowa, Planned Parenthood Federation of American and the Emma Goldman Clinic. The advocacy groups argue the law is unconstitutional and have filed a lawsuit to block the law, which bans most abortions if a fetal heartbeat can be detected. An attorney representing the state said the goal now is to quickly get the case before a judge so the state can argue the law is constitutional. Reynolds signed the law May 2, two days after lawmakers approved it. If the law is eventually allowed to take effect, the fetal heartbeat requirement would ban abortions around the sixth week of pregnancy — a time when, abortion-rights groups say, many women don’t even know they’re pregnant. Iowa Attorney General Tom Miller has refused to defend the law, so the Thomas More Society, a conservative Chicago-based law firm, has agreed to handle the defense for free. The law’s approval marked a dramatic change in abortion policy in Iowa. Until the 2016 election, the state had little to no role in the broad Republican effort to overturn Roe v. Wade, the landmark 1973 U.S. Supreme Court ruling that established a woman’s right to terminate a pregnancy until a fetus is viable. 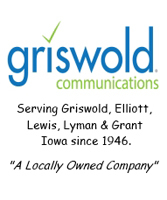 But the election flipped control of the Iowa Senate, putting Republicans in charge of the Legislature and the governor’s office for the first time in two decades. Up to that point, Democrats had maintained enough political power to curtail most Republican anti-abortion attempts. Lawmakers adopted several abortion restrictions in 2017, including a 20-week abortion ban and a requirement that women wait three days before ending a pregnancy. The waiting provision, one of the longest in the country, is on hold because of a different lawsuit. Separately, a new Iowa-based coalition of anti-abortion organizations was formed last year to renew efforts toward an abortion ban. The Coalition of Pro-Life Leaders, which includes Family Leader, put aside years of disagreement among the groups to help win passage of the 20-week ban and the six-week ban. Iowa Republicans last year also gave up millions in federal dollars to create a state-funded family planning program that prohibits participation from abortion providers such as Planned Parenthood. 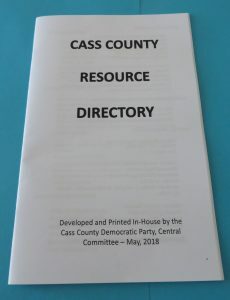 A county-wide resource directory that was sponsored and compiled by the Cass County Democratic party is now available. Democratic Party Chair Sherry Toelle said today (Friday), that the 30-page booklet lists resources from abuse reporting to volunteering. 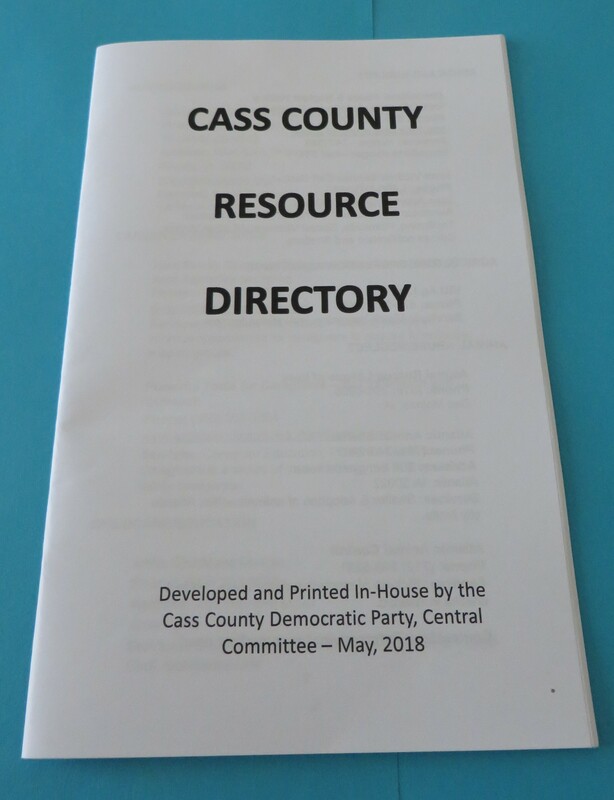 The Cass County Resource Directory is being distributed in Atlantic with plans to make it available to agencies and people across the county. In addition to the booklet, there is also a PDF version available for those who want an electronic copy of the directory. DAVENPORT, Iowa (AP) — Davenport officials have closed a bridge that carries thousands of vehicles daily after finding the span’s surface showed “widespread deterioration.” The Quad-City Times reports that city officials announced Wednesday that Elm Street bridge would be closed to vehicles and pedestrians. Assistant City Administrator Brandon Wright says city workers first discovered holes in the bridge’s deck on Monday. He says they immediately closed off the bridge, though some people continued to use the span. Wright says an inspector told the city midweek that the bridge should remain off limits. He says the city is waiting for a final inspection report and that it’s unclear when the bridge will reopen. Wright says the city received an estimate last year that says replacing the bridge would cost about $3.4 million.